Barack Obama and his half sister, Dr Auma Obama, at Kogelo, Siaya County on July 16, 2018. Auma Obama, the half-sister of former US President Barack Obama, has defended the beggar comment as she asked Kenyans to seek self-reliance. Ms Obama found herself in trouble with Kenyan social media users after she criticised Kenyans' behaviour of relying on aid instead of working hard to change their lives. "It is true Obama is coming to Kenya. He has done something, I have done something I can show the world. What have you done?" she said on Citizen TV's Opinion Court on Thursday. "Are we just waiting for the arrival of Obama so that we say we can be helped? Guys we need to get up and start working, do something to leave a legacy," she said. Her comments particularly appeared to have angered her tribesmen in Luo Nyanza after she added that they are fond of gonya (a luo term for borrowing behaviour). 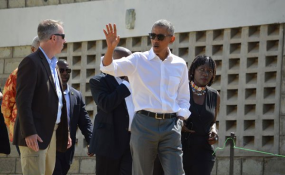 But during the official opening of Sauti Kuu Resource Centre in Kogelo on Monday, Ms Obama said her comments were a challenge to Kenyans to seize opportunities and improve their lives. "I insist, let us stop the gonya-gonya syndrome even if I get the flak for it. I am not calling Luos beggars. I am telling them that we need to start caring for ourselves because we can...", she said. She said Sauti Kuu would educate locals to harness their talent and use local resources to improve their lives. The centre, she said, is in discussion with Yale University for a programme on emotional intelligence. Mr Obama, in his speech, lauded Ms Obama's efforts in changing the face of Kogelo and Siaya. "When I think about the fact that Auma has now accomplished the centre, and when I think about the first time I came, I think that because she understood the story," he said.